Slowly, spring is arriving in Germany, and the people at Herrmann Kräuter in Neuss near Düsseldorf are certainly noticing it. People from the fourth generation of this herb grower now work 400 hectares of herb and cress varieties - and the peak season is near. In the asparagus season, wild garlic is very popular, says managing director Thomas Herrmann: "The first early wild garlic comes from France and Hungary, but now we have fully switched to German goods. This year, the harvest started a bit later due to the cold weather, and the season will end on April 20th." Another favorite herb of asparagus fans is the chervil: "We have had this herb -from our own cultivation- since March as well. We cultivate chervil on 23 hectares and 40% of the annual harvest is being marketed only in April, for the asparagus season." Chervil is also one of the seven herbs that are used for the well-known Frankfurt green sauce (borage, chervil, cress, parsley, pimpinelle, sorrel and chives), another spring specialty, often eaten with asparagus. "We offer ready-to-use herbal blends for green sauce, and traditionally the season for this dish starts on Maundy Thursday," says Thomas. In addition to these, Herrmann also has other herbal mixtures in the range, including those for soups and shell fish, as well as Asian and Mediterranean blends. 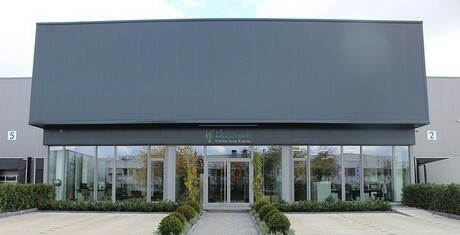 The company supplies packaging companies throughout Europe, as well as catering suppliers and food retailers. 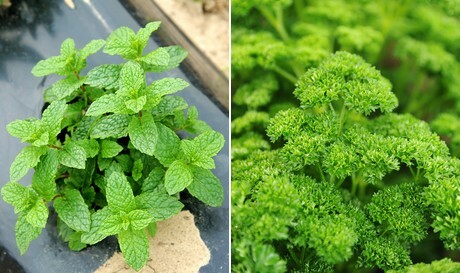 In summer, a good 150-200 tons of herbs per week are sold. In winter additional goods from Italy, Spain, Kenya, Israel and Morocco are purchased to meet demand. 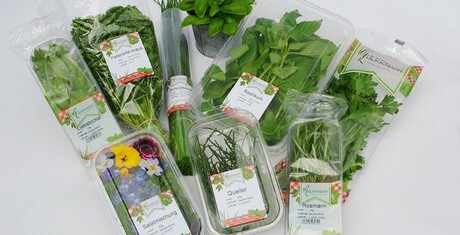 "In the summer, all our herbs are produced by ourselves. Only lemongrass is sourced from Morocco." 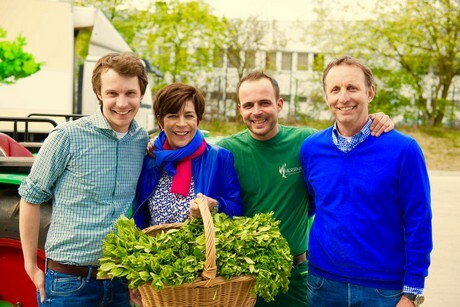 The Herrmann family has been working with herbs since 1946 and is now run jointly by the third and fourth generation. Originally, traditional types of herbs -like parsley, chives, and dill- and vegetables were grown. Since those times, the range has been completely switched to herbs. "We are always on the lookout for new, interesting varieties; the German kitchen is becoming more and more international and the demand for 'exotic foods' is growing," says Thomas Herrmann. Appropriate packaging also plays a role here. "We package our herbs for retail, but we also work with domestic and foreign cookware suppliers, and the right packaging is one of the things we value today."